Mick Catlin is hoping AFC Portchester can finish the season on a high with double cup success. The Royals meet Fawley tomorrow in the Wessex League Cup final – at their own Blanchard Wells Stadium (3pm). They are also set to play either Fareham Town or the Hawks in the Portsmouth Senior Cup final at Fratton Park next month. Having missed out on a top-three finish in the Wessex League premier division the Royals are keen to add some silverware to their trophy cabinet. Catlin feels ending their season on a high will give Portchester momentum heading into next season. The joint-manager said: ‘We have two cup finals coming up and it will give us a chance to put some gloss on our season. ‘In the league we came up a little bit short and a cup triumph will give us a bit of impetus going into the summer break. ‘The chance to play at Fratton Park will also be a great way to finish off the season. ‘Off the field, the club is ready to make the next step up the non-league ladder. ‘It is frustrating but I don’t necessarily agree when people say we have underachieved. ‘The two clubs who have gone up, Andover and Blackfield & Langley, have spent heavily and it was always going to be a tough ask to get ahead of them. ‘Next season will be the first full campaign for Ian Saunders and I together in charge. ‘It will be a busy summer as we look to bring in a few new players. 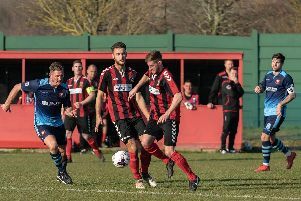 Michael Birmingham is demanding a final-day victory in the Wessex League premier division from Horndean when they host Newport at Five Heads Park tonight (7.45pm). The Deans boss wants to see his side achieve their highest-ever league finish. ‘A win will secure us fourth place,’ said Birmingham. ‘We are very tired and very depleted but can make one final push. Baffins Milton Rovers host Team Solent at the Kendall Stadium tonight (7.45pm). Fareham Town face an early start and travel to Portland United for a 1.30pm encounter on Saturday. The Reds are aiming to complete a league double over Dorset side after beating them 3-1 at Cams Alders earlier this week.